Just played a session of In The Light Of A Ghost Star with friends I’ve never played with before, most who had never played a TTRPG before. Everyone seemed to have a good time. I definitely did even though I’m always really self conscious when GMing for new people. I wrote up a little mutation table right before the game and that was a lot of fun. Lasts for 2d4 days or until another mutation takes over. Glow In The Dark - Your skin glows in the dark. Lights a 30ft area. Transmorph - Your mind and body go through a strange transformation. Switch Scientist and Fighter dice. The Fly - Bug like wings sprout from your back. You can only lift your self a couple feet in the air for a few seconds at a time but you can glide from high places. Glass Eye. One of your eyes becomes hard like a marble and falls out of your head. You can still see through it. Werepig- In light of a full moon you become a fierce humanoid warthog beast. Fighter=12 Explorer=4 Scientist=4. 1 in 20 chance of full moon every night. Monkey Tail- you suddenly grow a furry prehensile tail. Brainiac - Your brain mass doubles at the expense of the rest of your body. Scientist =10. Total health is 2. Also here are everyone’s character portraits. Belgian gaming blog jeepeeonline wrote about In The Light Of A Ghost Star and even created a French translation. Thank you jeepee! 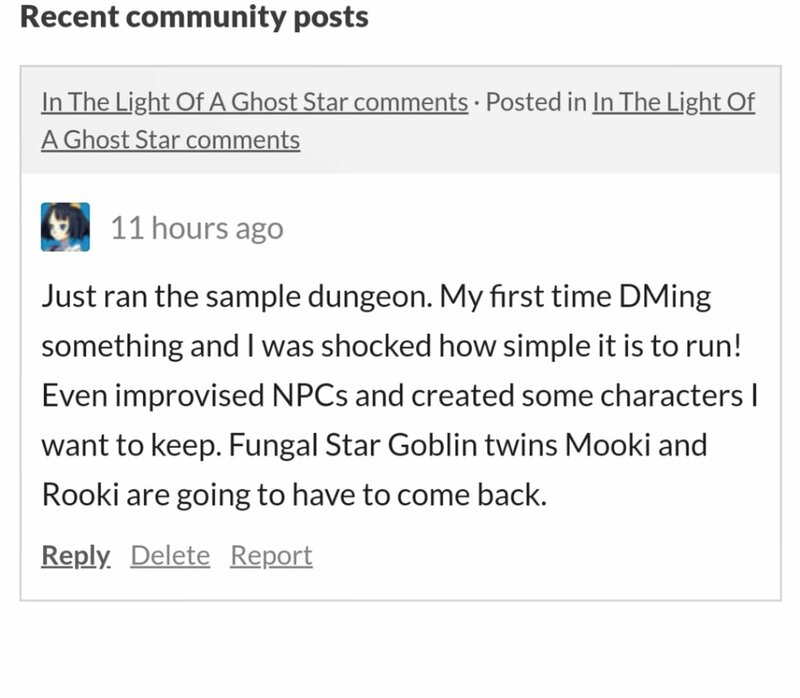 Thank you Outpost Owlbear for playing In The Light Of A Ghost Star and sharing your experience and great house rules! Check out their live stream!